Why Do You Need a Statement of Purpose for Education? Whether applying to college or university you will have to ensure that your application will make you stand out from all of the others competing against you for a place. Many will have very similar qualifications and your statement of purpose for education may be your only way of getting yourself noticed. It is your opportunity to sell yourself to the admissions committee and to impress them with your performance and ambitions. You have to ensure that your statement of purpose education format and writing are spot on if you are to have any chance of getting the place that you are aiming for. What Is the Correct Statement of Purpose Education Format? Check their specific formatting requirements and always follow them to the letter. Use a simple easy to read font such as Arial in 12pt size minimum. Never use multiple fonts or scripts and other hard to read fonts. Use large clear margins so that the page does not look overly cluttered. 1” minimum should be used all around. Only use white paper and black ink: colors and decoration should be avoided within your statement. Don’t over use caps, bold and italics within your text. Excessive use will simply confuse the reader. Take note of our education SoP sample: our examples will show you the areas that you will need to cover in your writing and the style of writing you should employ. Do not however simply copy any statement of purpose education sample as yours must be unique to you. Carefully check the requirements of the program that you are applying to with regards to how your statement should be written and any prompt that you may be required to answer. Read all of the information available around the college and program you are applying to. Identify what they value in a student so that you can reflect this in your application. Write your opening with care: your hook must get the total attention of the readers and motivate them to want to know more about you. Find an interesting anecdote around which you can tell a relevant story about yourself: your statement should flow like a story and not simply be a list like your resume. Give clear examples of what you have achieved: do not just say what you can do, back up your claims by showing what you have done. Write concisely: only use as many words as you need to make your point. Your statement is restricted in length and you must make every word count. Write about yourself and your future goals: your statement should not be written about others. Keep your writing totally relevant to gaining your place: if it does not add to the purpose of the statement it does not belong within it. Take care to proofread thoroughly: mistakes in your writing will give the wrong impression to the committee members. It is also important to remember that words have the capacity to influence your readers and this is why you should choose the words that you will use in your essay. Avoid terminologies, words and slang language that will throw off your readers. You must bear in mind who your readers are and they have read hundreds of SOP so narrowing down the best ones can be tough. If you are not satisfied with your statement of purpose education, you can always start again which is why writing your SOP early is very crucial. Besides, you may know more about statement of purpose computer science on our site. Do not repeat information that is included elsewhere in your application: so do not simply try to repeat your resume in prose. Do not copy anything: your statement must be unique and about you. Any form of copying could see your application refused. Be honest in your application: lies and exaggerations are very simple to uncover and will again cause your application to be dismissed. Do not make excuses for any poor performance: this is not the place to discuss any problems. Do not use clichés or statements that are obvious: your writing must be unique and each statement must add value. Explain why you are interested in the field of education and what steps you have already taken in your education in this area. Show that you have the skills and the experience required to pursue your studies and career within education. Describe where you see your future career heading once you have graduated from this program of study. Explain what you are looking to take from this program and what unique contribution you hope to make. Show why you are applying to their program rather than one of the many others that are available. For more inspiration, review a sample sop for MBA written by our best experts. The most important advice when writing your statement of purpose is to always proofread. The overall quality and impact of your statement of purpose education is vital if you want to ensure your admission. You will be competing with equally qualified applicants and this is why you should always make sure that everything from your application letter to your SOP will be of top notch quality. 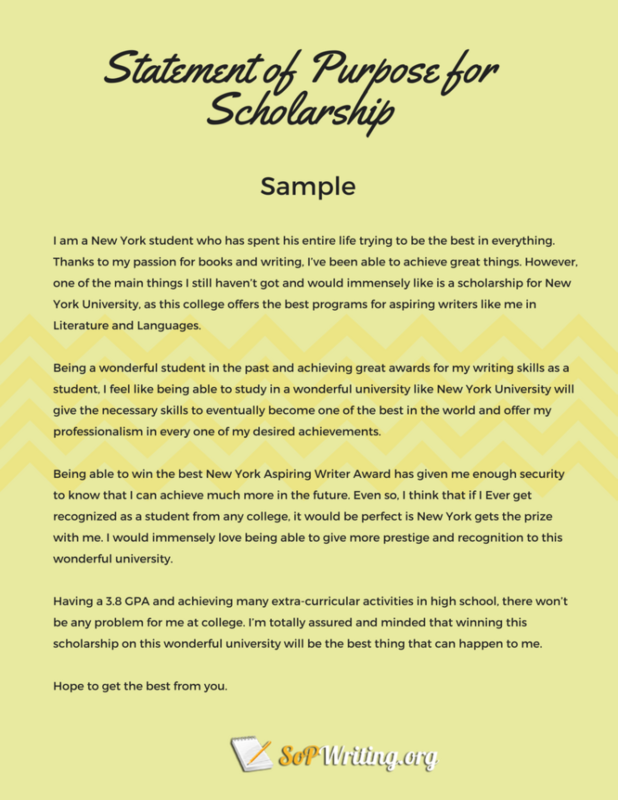 Write the best SOP education or scholarship personal statement now and get into the best programs! 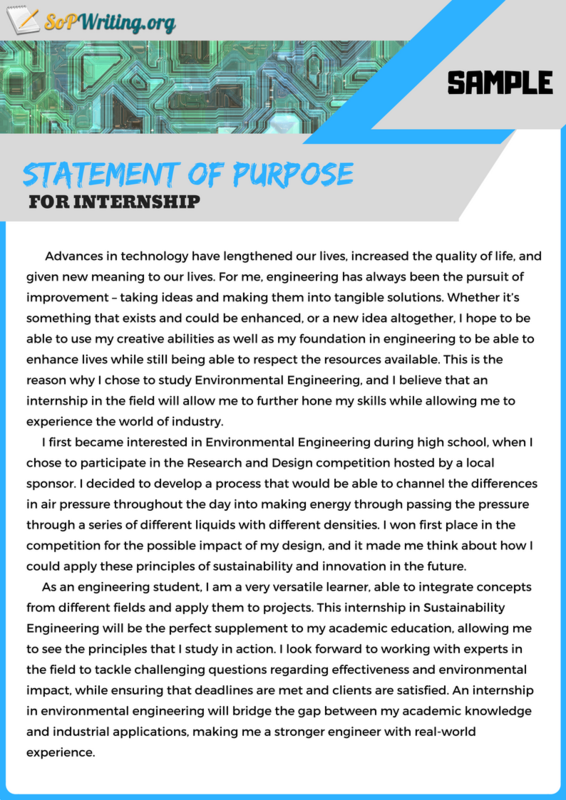 Write an effective application with the correct statement of purpose education format with our professional guide!